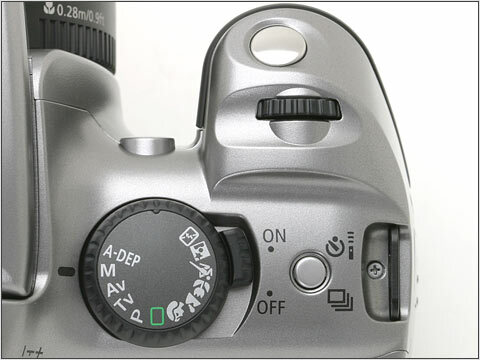 Controls on the top of the EOS 300D are all found on the right side within reach of your index finger. At the top we can see the shutter release button (soft half-press, click full-press), main dial, exposure mode dial, power switch and drive mode button (press for single shot, continuous or self-timer). The exposure mode dial controls the manner of exposure operation be it fully automatic, a pre-programmed scene composition, flexible program or a range of manual and semiautomatic options. In the user manual Canon breaks these exposure modes into three groups; Basic & Image Zone exposure modes and Creative zone exposure modes. Full Auto and the six scene exposure modes ('Image zone') are collectively referred to as the 'Basic Zone'. In all of these modes White Balance, ISO and Focus Point selection are automatic, Metering mode is Evaluative, Exposure compensation, AE Lock, Bracketing and RAW Image format are unavailable. Other settings depend on the mode selected (see table below). In the basic zone the camera will indicate that blur may occur because of slow shutter speeds, it does so by blinking the shutter speed on the LCD panel and viewfinder status bar. The five exposure modes will be more familiar (and preferred) by most prosumer / professionals. All menu functions and camera settings are available in these modes and can be used in any combination.  1/15 F4.0 (roll left two clicks) etc. In this mode you select the shutter speed and the camera will attempt to select the best aperture for a proper exposure (based on the current metering mode). Shutter speed is displayed on the viewfinder status bar and on the LCD panel, roll the main dial to select different shutter speeds. A half-press of the shutter release causes the cameras exposure system to calculate the aperture, if it's outside of the cameras exposure range (for instance trying to take a shot at 1/500s in darkness) the aperture will blink. AF mode is locked to AI Focus, Metering is Evaluative unless you press AE Lock when it switches to Partial. In this mode you select the aperture and the camera will attempt to select the best shutter speed for a proper exposure (based on the current metering mode). Aperture is displayed on the viewfinder status bar and on the LCD panel, roll the main dial to select different apertures. A half-press of the shutter release causes the cameras exposure system to calculate the shutter speed, if it's outside of the cameras exposure range the shutter speed will blink. Available apertures will differ depending on the lens used. AF mode is locked to AI Focus, Metering is Evaluative unless you press AE Lock when it switches to Partial. In this mode you select the aperture and the shutter speed from any combination of the above (plus BULB for shutter speed, apertures limited by the lens used). Turn the main dial to change shutter speed, hold the exposure compensation button while turning the main dial to change aperture. Half-press the shutter release and the meter on the viewfinder status bar and LCD panel will reflect the exposure level compared to the calculated ideal exposure, if it's outside of +/- 2EV the indicator bar will blink either + or -. AF mode is locked to AI Focus, Metering is Center Weighted Average unless you press AE Lock when it switches to Partial. This mode, seen before on other Canon EOS cameras automatically controls the depth of field to ensure that all the subjects covered by the focusing points, from those close to the camera to those far away from the camera remain sharply defined (are within the depth of field). AF mode is locked to AI Focus, Metering is Evaluative unless you press AE Lock when it switches to Partial. As you can see from the table below the EOS 300D is far more restrictive than the EOS 10D in selection of AF mode and metering for each exposure mode. Indeed if you want (or need) to be able to select AF mode or Metering mode in any of the 'Creative' exposure modes (P, Tv, Av or M) then the EOS 300D is not the camera for you. The availability of options such as drive mode and flash mode are identical to the EOS 10D. Differences between the EOS 300D and EOS 10D are highlighted in red. Forced AI Focus such a disadvantage? There has been much musing on our discussion forums about the implications of the AF mode being locked to AI Focus for the majority of the 'creative' exposure modes. I can honestly say that with careful use it is not an issue for 95% of everyday amateur photography. In a still shooting situation AI Focus appears to use One Shot AF initially, and thus there is no delay or difference in focus speed. Once AF is locked AI Focus monitors the scene and will only break to AI Servo mode if it detects movement (towards or away from the camera*) at the focus point and exact focus distance (thus it is not fooled by panning, background movement or movement in front of the focus distance such as people walking across your path). This is obviously best achieved by using a single selected AF point (such as the center point). You can easily pre-focus (half-press), recompose and take a shot whenever you like.